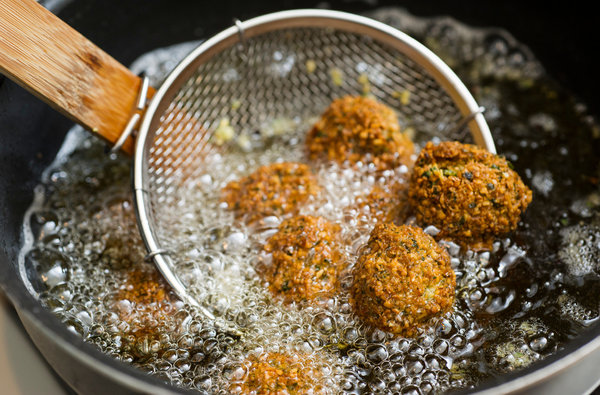 Is Air Frying Healthier Than Deep Frying? Which Oil's Best for Each Method and How Do They Compare to Cooking? Air- or deep-frying, what's healthier? For most people that's not even a real question... rightly so? "That's even a question?" I know, I know... With the health aura surrounding air frying it appears to be hilarious to even base a complete episode of SuppVersity | True or False on the question whether air frying is in fact so much healthier than deep frying, but listen up: a recent study from the University of Porto says that "most chemical parameters were similar on both frying processes, including [pro-carcinogenic] acrylamide content" (Santos 2017). Can it really be that the air frying devices are another overhyped kitchen device you don't really need? Taste of Olive Oil Heals - Flavor's Enough! Frying Does not Just Oxidize Oils, It Does Fat More! Air frying will do less harm to antioxidants like vitamin C: Even though the fries in Santos study showed only "slightly better results" for the amount of ascorbic acid in the final product, it's the trend that counts - especially, in view of the fact that you may expect to see similar effects with other foods and/or antioxidants. the crispiness of air-fried fries and deep-fried fries was likewise impaired with canola oil; in that, there was a trend for increased crispiness w/ deep frying. 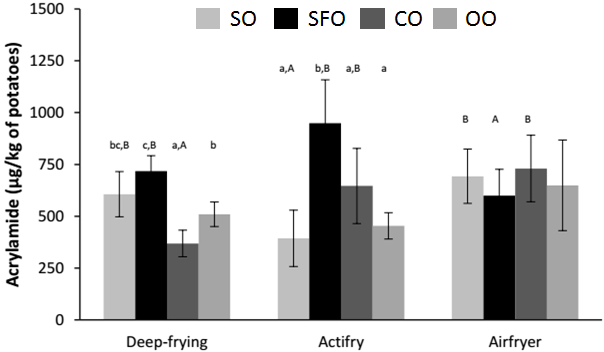 the color attributes and odor intensity presented higher scores in deep-frying than air-frying (p < 0.05); and again, canola oil was the odd one out with potatoes fried in CO (deep-frying and Airfryer) showing inferior odor attributes than other vegetable oils (p < 0.05), probably due to increased fatty acid oxidation, consistent with its increased PUFA content. With respect to the overall acceptability, the subjects who are used to consuming fries that are fried in sunflower oil (that's the way people do it in Spain) awarded the SFO-deep-fried fries the highest, the ones that were fried in canola oil the worst score. 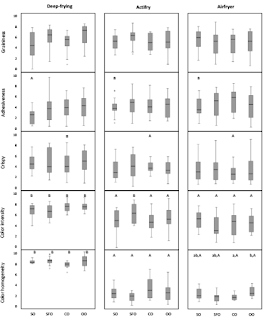 Figure 3: Health and taste may often deviate, but the fact that olive oil was the best compromise for both (even though individual subjects didn't like the taste), taste and predictable health effects based on oxide-formation (Saontos 2017). A completely different image emerges for air-frying, where using sunflower oil produced the lowest and using soybean oil the highest score. That's bad news? Well, not really, because olive oil came to the rescue and achieved, albeit with a high variability within the panel, ratings similar to the best potatoes for both frying processes. Photos of the devices that were used in the study. No sign. differences were observed between the Tefal and Phillips devices, which makes it unlikely that you'd seen different results w/ your air frying device at home. 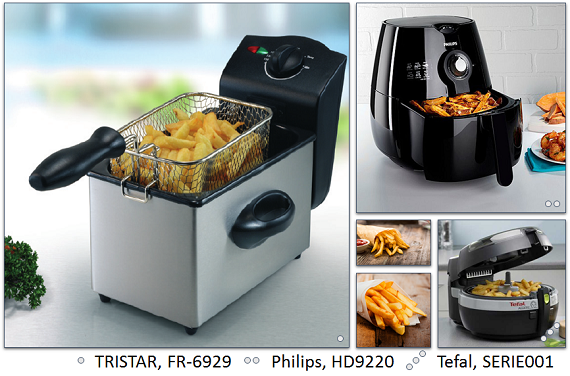 Methodology: Deep-frying was carried out in a domestic electric fryer (TRISTAR, FR-6929) with adjustable temperature up to 190 °C, 1.75 L capacity, and maximum load of 200 g per L. A portion of potatoes cubes (200 g) was fried in 1.5 L of vegetable oil, at 175 °C, during 6 min. The temperature was periodically controlled with a calibrated digital thermometer. 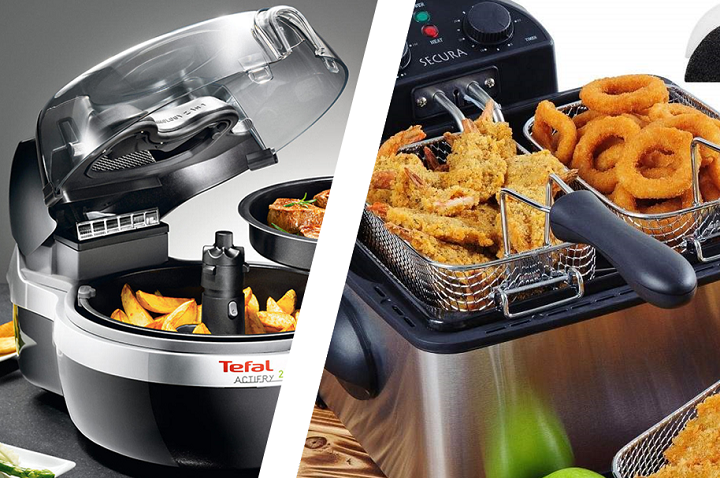 Air-frying was tested in two different equipment’s: Actifry (Tefal, SERIE001) with a nominal power of 1400 W, and Airfryer (Philips, HD9220) with a nominal power of 1425 W. A portion of potatoes cubes (300 g) was involved in 3.6 g of vegetable oil, and fried during 20-25 min (Actifry) or 15-20 min (Airfryer; manual agitation at 10 and 15 min), adjusted to the equipment’s specifications. Olive oil will also have no (sign.) effect on the amount of pro-carcinogenic acrylamide, of which I've previously pointed out that it was not affected by the device in which the scientists fried their potato sticks. Figure 4: Levels of acrylamide according to frying method and oil used to fry/involve the fries before frying; commercial soybean oil (SO), sunflower oil (SFO), canola oil (CO) and olive oil (OO) all from the supermarket (Santos 2017). 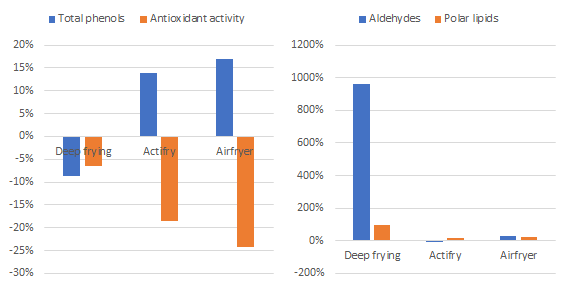 What did affect the levels of acrylamide, at least in the Tefal Actifry device, was the type of oil that was used; with the highly popular sunflower oil (SFO) triggering a significant increase in the formation of acrylamide, it should be quite obvious that this shouldn't be your #1 choice for air-frying even if you don't own a Tefal device, in which the increased acrylamide formation may be explained by the direct contact with the chamber surface. What's the latest on frying and your health, anyway? In one of the most recent reviews of the health effects of fried foods, Luke Forney highlights that "[n]ot all fried oil[/food] is equal" - or, as I would like to say: not all fried food is evil ;-) As a SuppVersity reader you will be aware of the so-called "French Paradox", i.e. the observation that the French eat all the good foods, the Americans deem unhealthy (high-fat cheese, absolutely non-whole grain baguette, etc.) and wash it down with liters of red wine and still have a significantly better heart health and smaller waists than their low-fat munching Amerian friends. 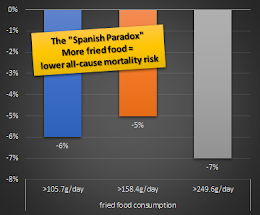 The "Spanish Paradox" shows no significant increase in heart disease risk (not shown in this figure) and, if anything, a non-significant reduction in all-cause mortality with increasing amounts of fried foods in the diet (Guallar-Castillón 2012). For fried foods, however, it's the "Spanish Paradox" (Guallar-Castillón 2012; Gadiraju 2015), as frying is much more important in the Spanish than it is in the French cuisine. On the other hand, the Spaniards eat fried foods no more than three times per week and, probably, more importantly, (a) make the right oil choice(s) by choosing refined olive oil (not extra-virgin) over higher omega-6 or less stable oils and (b) avoid using oils repeatedly (that's a common practice in every fast-food restaurant). Thus they prevent the formation of both harmful phytosterol oxidation products (from using extra-virgin vs. regular olive oil | Ryan 2009) and polycyclic aromatic hydrocarbons (from (re-)using oils or using oils with a low heat stability, e.g. soybean oil, walnut oil, etc.). Addendum: The topic of reusing oils is important enough for an addendum based on a study that has been published one day after I published this article. 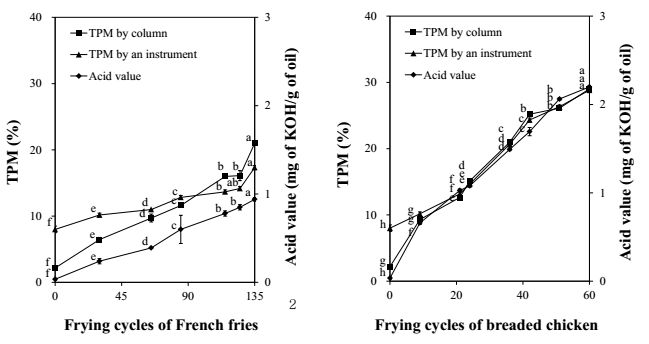 Figure*: Changes in key-markers of oxidation (total polar material, TPM, and acid value) in french fries and breaded chicken, (Sung 2017). 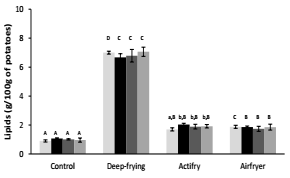 In their experimental analysis of the oxidative properties of a commercial standard frying oil mix of soybean oil and palm olein (6:4 ratio with 650 ppm added tocopherols) as it is used in many fast food restaurants, Song et al. (2017) show that the key-markers of oxidation increase by more than two- and tenfold within less than 20 and less than 10 frying cycles (both happens even in the best fast food restaurants) in potatoes = french fries (Figure*, left) and breaded chicken (Figure*, right), respectively. With that being said, Forney's review also reminds us that it's not necessarily the often overestimated amount of oxidized fat in fried foods that's making fried food lovers fat and sick. Rather than that, it is their high calorie-density and thus their significant contribution to "weight gain and obesity, which then increase diabetes, hypertension, and hyperlipidemia, which in turn are the most important factors leading to cardiovascular disease such as heart attack and stroke" (Forney 2016) - so, never forget: calories count, it's just more complex than CICO. There's no question that you'd be better off not frying your potatoes, at all. If you insist on frying, air-frying is the sign. healthier method when all's said and done. Moreover, common sense will not tell you that deep frying will leave your potatoes with significantly higher amounts of tocopherols (vitamins E) than air-frying, which, in turn, has the advantage of lowering the vitamin C content to a similar extent as cooking and thus sign. less than deep-frying. Unlike deep-frying, which will reduce the total phenolic content of the content sign. (with olive oil reducing the loss to 3% and sunflower oil increasing it to 18%), air-frying will actually increase the number of phenolic compounds compared to boiling. In that, it is important to note that it would be stupid to use this observation to say that air-fried potatoes are healthier than cooked potatoes; after all, there's an apparent decrease in DPPH radical scavenging activity for both air-frying devices (p < 0.05 | see Figure 4, right). 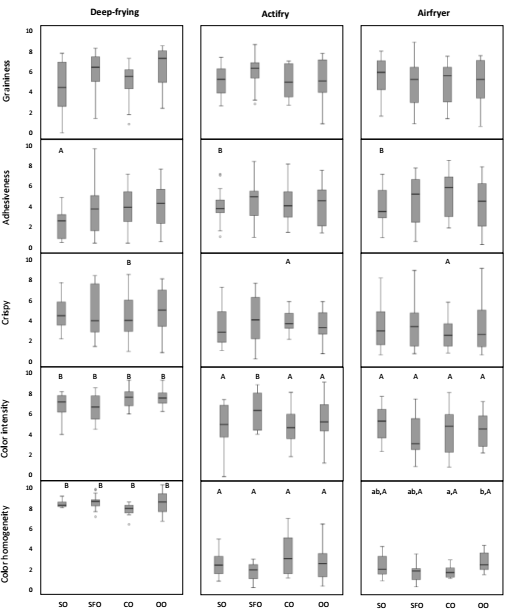 And for those who are still not convinced, the scientists' analysis of the amount of unwanted and unhealthy secondary oxidation products, namely unsaturated aldehydes, that were estimated by the anisidine value (p-AV), likewise adds to the evidence that if you want to eat fries, you'd choose the ones from the air-fryer over deep-fried fries, which presented consistently a higher fat degradation state in comparison with all other processes (p < 0.05). Air-frying, on the other hand, left most if not all of the fats intact and showed no significant difference to the control (=boiling) condition. Similarly encouraging results were found for the total content of polar compounds (TPC), which increased only with deep- not with air-frying. In my 2014 article about the "Quest or the Optimal Cooking Oil", canola oil fares much better than in the study at hand. Why is that? The reason is quite simple: it's not the same oil. Unlike the study at hand, the studies, I cite to verify the usefulness of canola oil for frying, all used high-oleic acid canola oil, which is high in MUFA and low PUFA - similar to olive oil | more. Bottom line: You won't be surprised to hear that air-frying is indeed healthier than deep-frying potatoes. I am pretty sure, though, that you would not necessarily have expected the good old (non-virgin) olive oil to rank so high for both the sensory and the chemical qualities of fries. I have to warn you, though, while I see no problem with using olive oil to involve your potato sticks before you turn them into Pommes Frites in an air-fryer, Frying in olive oil for more than 6 minutes, at temperatures >190°C or re-using the oil as it is done in 99.9% of the restaurants and commercial kitchen (who would throw away the oil after using it to fry a single serving of potatoes) will affect olive oil to a significantly greater degree than the low PUFA oils I suggested for frying in my 2014 article about "The Quest for the Best Cooking Oil" | Comment on Facebook! Fortney, Luke. "Fried Foods: Friend or Foe?." Integrative Medicine Alert 19.3 (2016): 25-28. Gadiraju, Taraka V., et al. "Fried food consumption and cardiovascular health: A review of current evidence." Nutrients 7.10 (2015): 8424-8430. Guallar-Castillón, Pilar, et al. "Consumption of fried foods and risk of coronary heart disease: Spanish cohort of the European Prospective Investigation into Cancer and Nutrition study." BMJ 344 (2012): e363. Ryan, Eileen, et al. "Phytosterol oxidation products: their formation, occurrence, and biological effects." Food Reviews International 25.2 (2009): 157-174.